The Perth Congress was held last weekend at the Salutation Hotel (an excellent venue – and has been welcoming guests since 1699?!?) – with a significant number of club members taking part. No prize winners in the Open but good 3½/5 scores by both CM Paul Roberts (drawing with the eventual winner Junhao Xian in the second round but then losing to IM Mark Orr in the third) and Willie Rutherford (losing to Max Turner in the third round). Robert Kane, Benjamin Ridge and Michael Ridge all scored 2/5 and David Robertson ended on 1½/5. In the Major six players came first equal on 4/5 leaving Ian Whittaker as 7th equal on 3½/5 (sharing the U1650 grading prize). Keith Aitchison followed closely behind on 3/5 and Will Samson scored 2½/5. Leading on 100% into the final round of the Minor, after a marathon fourth round win which only finished just before the start of the final round, a drained Allan Buchan unfortunately lost his final game to Gordon Greig, the eventual joint winner, coming third equal (on 4/5). Andrew Rutherford (Tiger Cubs) was close behind on 3/5 coming sixth equal and Mark Smith ended up with a score of 3/5. 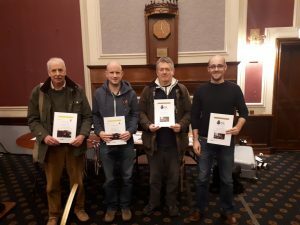 Members ventured into darkest Fife in January for the Kirkaldy weekend congress. In the U2200 Mike Ridge came in second with a score of 3/4 ahead of third placed Benjamin Ridge on 2½/4, followed by Robert Kane on 2/4 and Vipin Zamvar (0/3). Keith Aitchison came second in the U1800 tournament with a score of 3/4 and Calum McGillivray scored 1½/5. The Lothians Allegro was held at the Bainfield Bowling & Social Club on 13th January with a number of club members taking part. David Robertson was in the Open scoring 1/5. In the Challengers Ian Whittaker came second on 4/5 followed by both Raj Bhopal and David Archibald, who were third equal on 3½/5, and Robert Kane on 2½/5. In the Major, Calum McGillivray scored 4/5 to come in at second equal, with James Hartman (from the Tiger Cubs) following in sixth place with 3½/5 and Jonathan Fallman (who scored 2/5). Allan Buchan was first equal in the Minor (4½/5) followed by Jennifer Shelley and Mark Smith (both with 2/5). Full tournament results are on the Chess Scotland web site. Again let us know of any ommissions. Catching up on congress results in the last few months – we start with the Oban Congress held in November; one of the most scenic venues of the events calendar with views over to the island of Mull. A number of members went over to the congress. Mike Ridge and our president Neil Berry (FM) played in the Open, with Neil finishing third equal on 3½/5, behind two IMs: Andrew Greet was the winner on 4½/5 and Mark Orr was on 4/5. In the Challengers, Robert Kane achieved second place with a score of 4/5 with Benjamin Ridge scoring 3/5 (sixth equal) followed by Keith Aitchison with 2.5/5. In the Minor, Allan Buchan and Mark Smith both scored 3/5 coming sixth equal. If we’ve missed anyone please let us know. On 22 January 2019 the club innovated (at least in modern times) by playing an odds competition. There were two teams comprising of the stronger four players, and the less strong four players. The stronger player gave up one pawn for every hundred point difference in their grading compared to the the less strong player. 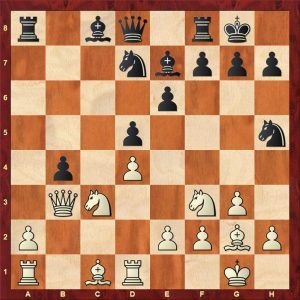 A maximum of seven pawns or their equivalent could be removed from the board. In one game the stronger player chose the material to be given up and in the other game the opponent chose the material. There were substantial differences between the opponents in grading. Under normal circumstances, we might have expected the result to be a resounding win for the stronger players, perhaps 7:1 or thereabouts. However, the result was 3.5-4.5 i.e. the stronger players lost. It was an interesting and fun evening. The result indicated that the odds we chose were roughly right for allowing unequal battle between two dissimilar players. In many ways, this resembled the handicapping system in golf where players of different abilities can compete more or less equally, thus maintaining the sense of competition.